Giving short measure or trying to pass-off substandard goods is not a modern phenomenon. As the following notice from The Norwich Mercury of December, 1757 shows, the masters of the trade guilds sometimes took strong action against those who threatened to undermine the reputation of local goods. Fine woollen fabric was the principle source of Norwich’s wealth at the time, so it’s not surprising everything to do with the quality of its manufacturing was taken seriously. What first seemed slightly odd to me is that the action in this case was being taken by the Guild of Woolcombers  against spinners who tried to sell yarn in reels that either did not hold the required length or included amounts improperly spun. Then I found out that many woolcombers in Norfolk were also yarnmasters . Notice that the two miscreants are both women. 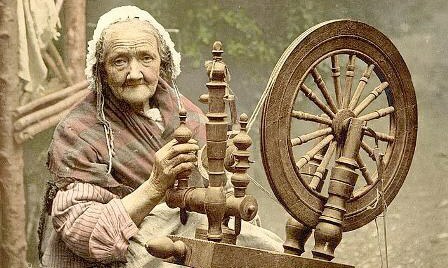 Spinning was commonly ‘women’s work’, while men did the weaving. Because it was usually unmarried women who would be kept busy at their spinning wheels – married women had the household management to attend to as well as the children – the word “spinster” over time became the general term to denote those women who had not married. WHEREAS at a Meeting of the Master WOOL-COMBERS of the City of NORWICH, it was unanimously agreed to put the Laws in Execution against all such Spinners who shall be detected in the Reeling of short or false Yarn; and since the said Resolution was taken, two Examples have been made, Viz. Mary Goldspink, of Westhall, and Elizabeth Manning, of Halesworth, being carried before Sir THOMAS ALLES, was [sic] by him ordered to the House of Correction at Beccles, there confin’d to hard Labour for 14 Days, and twice whipp’d. Therefore in order that none may plead Ignorance, neither blame any one in particular of Severity: This publick Notice is given, that we are resolv’d to the utmost in our Power, to detect and punish all such Offenders. N.B. No Threads turned first Lea  or last, and full seven Lea Binders, otherwise will be deemed false Yarn. Given under our Hands, this 18th of October, 1757. This entry was posted in Commerce, Tid-bits. Bookmark the permalink. Very interesting – and I did not know the origin of the word ‘spinster.’ As a child I learned to comb wool, spin it on a spinning wheel, dye it and weave it. All part of growing up Pilgrim, but such fun! I still like to knit with hand spun and naturally dyed yarns.